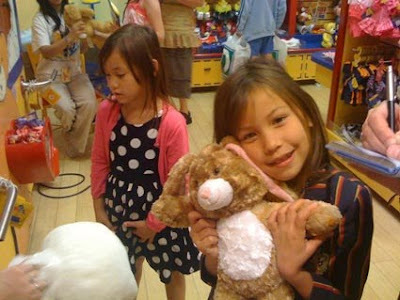 This weeks Saturday review is of our visit to the Build A Bear Workshop. ModelGirl and I have been before but this was a first time treat for FunnyGirl who had only visited the store to buy clothing for the panda that she had been given for Christmas. Luckily the store was quiet when we arrived which made the whole experience a whole lot more enjoyable. The girls were told that they could choose any bear and a full outfit so they were pretty excited. This gave us quite a problem as there were too many bears to choose from! ModelGirl being the bunny lover that she is settled for a rabbit (after picking up and putting down just about every other available option!). FunnyGirl - as we know, has a bit of a thing for Pandas - but her lovely big sister had already made her this one, so she really was in a pickle about which one to choose. A good fifteen minutes later she settled on the Hello Kitty. ModelGirl already has this one at home but as we have a joint collection of Hello Kitty stuff - it's more the merrier. 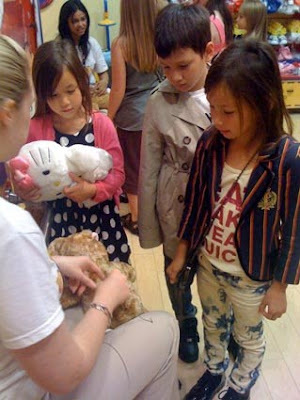 After choosing their bears - the girls had to decide which sounds that they would like to put in them. 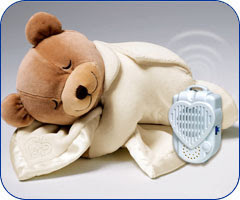 As with the bears, there are lots to choose from including the option to record your own message. This is great if you are making a bear as a gift for someone - and when ModelGirl made the panda for FunnyGirl's Christmas gift last year this is what she went for, recording a message that said; "I Love you Boo Boo!" Yes, it brings a tear to your eye - but none of that for us today - it was Hannah Montana and I Love you - all the way! You get to choose how cuddly you want your bear to be from soft, cuddly or big and fat and you step on the peddle that starts the stuffing machine. They also pop in a bar code that registers your bear to you. This means that if you and your beloved bear get parted and returned to one of the Build A Bear Stores then they will know who the lost bear belongs to. A good idea in theory but I have to wonder how many people would know that the lost bear had come from a Build a Bear Workshop and that if they took him in he would be reunited with his lost child? Good marketing though. Before the stuffing is completed you get to choose your bears heart, rub it in your hands and fill it with love and wishes before it gets stitched up inside. A free heart comes with the cost of the bear but you can also choose a charity heart for £1 or a cool beating heart for £4. 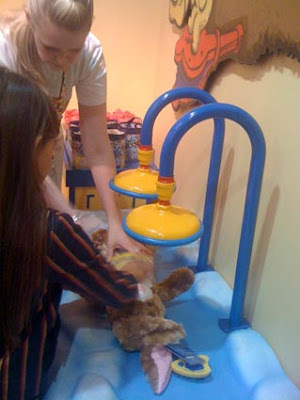 Next you are on to the Fluff Me station - you put your bear into a bath and he is showered with air to fluff him up and make him snuggly, after a little brush he is good to go. If you are building a bear on a budget - or if it's for a gift then now is a good point to quit. You still get the little house box, birth certificate and access codes to get onto the interactive Build-A-Bearville site but it is so easy to bust your budget when you get to the dressing stage. Clothing and accessories take up at least half of the store. There are complete outfits, mix and match separates, accessories and just about ever themed costume you could think of from SpiderMan (great mask!) to a Beefeater and a surgeon to a cheerleader. 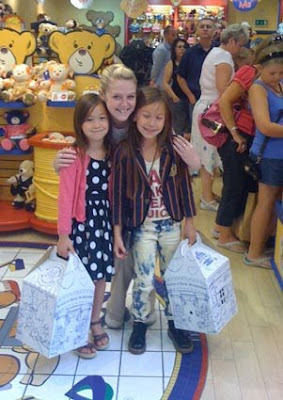 The girls had a really good time making their bears, a trip here is a lovely treat. It's not all girlie though - there are some things that would appeal top boys but TotallySonny was not interested in the slightest! 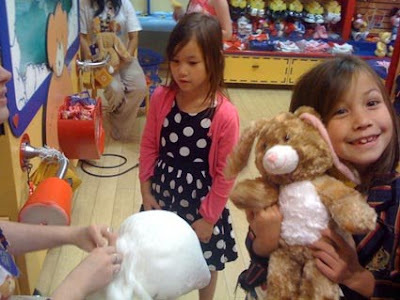 Some of the Build A Bear Workshops host birthday parties from £8 per head, they would definitely be a contender if we had a local store as I hate the endless stream of same old parties each year. Not too bad if you have one child but times it by three and the odd bit of excitement goes a long way! 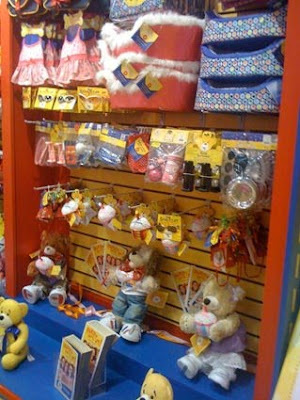 Bears range from £8 to £18, sounds £2 - £5 and hearts free to £4. Now this Gro-Clock review is a tricky for me. I have to say that when I saw it in a mag recently that I truly wanted it to be the answer to our five and a half year old early rising problem that is FunnyGirl. I have a very strong affinity with the guys at Grobag as I (yes little old me) was the PR who successfully launched their sleeping bag to the global masses. "I don't think that you can get press on a baby sleeping bag." That night I went home armed with the said Grobag. 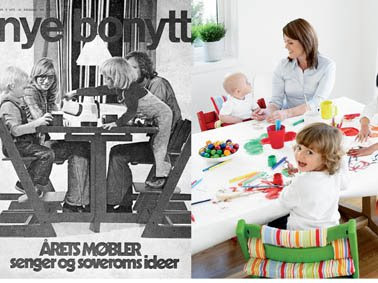 ModelGirl was our mini bambino of the time, she slept OK, woke early, went to bed late. Liked too much boobie action in the middle of the night (a bit like her dad). I had no hopes - no dreams. Simply zipped her up and off she went. 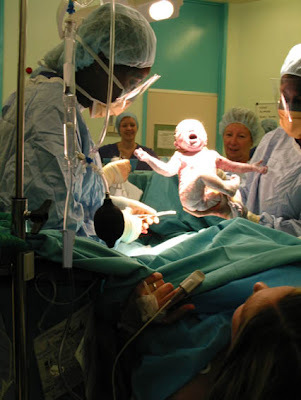 That night there was no last feed at 11pm and I had the first full nights sleep that I had had since she was born. So to cut a long story short... How many people do you think that I told about that? From that night on ModelGirl went down to sleep at the same time as DinoBoy (or TotallySonny as he is now know) at around 6.30pm and didn't stir till at least 8 - or 9am the following day. You get the picture. It drives us all crazy that she makes us get up before 6am and then she sleeps for England at her leisure. There will be some of you out there saying, well don't let her have a sleep. Yes... OK, you try and stop her. She has been known to fall asleep mid conversation or even once in a restaurant when I simply turned to the other side of me to pick up a napkin from the floor. I turned back to cut her food...... Gone. So. You get the picture....... We neeeeeeeeed FunnyGirl to stay in bed. Just for one day, just till it's normal O'Clock. Six would be good. Seven would be nirvana. 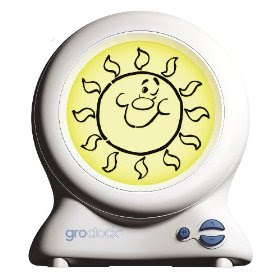 I saw the Gro-Clock in a mag and so I called the Gro MD (name dropping if you like) and asked him to send me one. He kindly obliged. It arrived the next day. "Look" I said to FunnyGirl, "How exciting a special clock for you - that is going to tell you when it's time for you to get up in the morning." Ahh yes, I knew that well. It was cuddle past darkness in the not time to get up past scale. Set the time wrong I pleaded to hubby, but he being the more honest (not in PR one of our partnership) said NO. "She's not stupid." And he was right. So we set the clock. At night time it shows the moon and you set it to whatever time you want it to show the sun. Plenty of opportunities to make them sleep in till lunch time if you so choose but not on hubby's watch! Off we went to bed. Day 1 - Funny girl stormed in at 5 something... we had had a later than usual night wrongly thinking that we may actually get to stay in bed till 6... Wishful thinking. She was so excited that she woke early to wait for the moon picture to change to the sun and after at least an hour of waiting she had to rush in to tell us that her stupid new clock didn't work. You can't pull the wool over her eyes! Day 2. By this point I was starting to feel like the wolf in the three little pigs, continually out smarted by those pesky little blighters. Again, she pounced on us earlier than usual. Fine I thought. This calls for a plan. So I said to her.... "Tomorrow morning I will meet you at 5am at farmer Giles field where we will pick apples..."....eeeekkkkk Ok so I read too many Ladybird books. She wasn't going to be that easy to out smart and as it happened we kind of settled on a mid ground. We agreed to a wake up time of 6.30am. That if she wakes before then - that she has to play in her room. A couple of weeks have passed and the one thing that having the Gro-Clock has taught me is that FunnyGirl had no idea of what time it really was when she woke up. So to come in to our room to be met by two grumpy parents, really wasn't her fault. Wake up time - is just like bed time and play time. It's set by boundaries and whilst most five year olds could probably tell you what time they go to bed - how many of them could tell you what time they're supposed to get up? Gro-Clock taught me a lesson. It taught me that I shouldn't expect my wonderful daughter to live by rules that I don't tell her even exist? All that aside - it is a pretty cool nursery clock - and I like it. 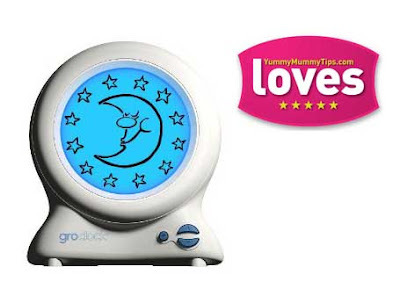 Gro-Clock RRP £39.99 is MummyTips Must Buy for any young child. I just wish that I had tried it sooner - I may have had a few extra hours sleep in my life! Well done Rob and Ouv, another fab product. So the are actually two things that I learnt at BlogHer09. The first was how to cook bacon and the second was the all American Breakfast bagel. 3 - Egg white? what's wrong with the yolk? OK... so everyone that knows me will vouch that I'm not a big breakfast kind of girl.... but when in Chicago my body clock was all over the shop and my midnight chicken kebab thoughts morphed into breakfast bagel.... I don't know how - so don't ask. Anyway, there I found myself in an actual Bagel store (very odd) and I ordered... (even odder). To be fair - I had no idea what I was getting.. and yes I we were speaking the same lingo but hell Bagel, breakfast... you don't get all that in the English countryside. So when I walked out of the deli, warm bagel in hand, I must say I was more than a little bit excited! I rushed the two blocks back to my hotel and called back home. "I have a bagel" I excitedly announced. But OMG.... They missed out BIG TIME! I was so not expecting the total taste sensation..
That night it was the total of my love email back home to my hubby - for I knew that this said Bagel would become him! Fast track back to the UK... and here is the totally stunning BlogHer09 Breakfast Bagel recipe! A Nutty Bagel is best. So it was the morning of the second day of the main BlogHer conference. At that point I was still a little down on the event as a whole. I went and sat down to check my emails and a couple of other ladies came and sat close by. One of the ladies was leading one of the Geek lab sessions later that day and we got talking about popular posts on our blogs. Someone else joined in and she said that the most popular post in the history of her site went back about two years and was still getting really good traffic today. Naturally I asked her what it was about and she said that it was pretty random and not at all the usual stuff that she wrote about. Interesting... I said and how do you do that? You cook it in the oven she replied! 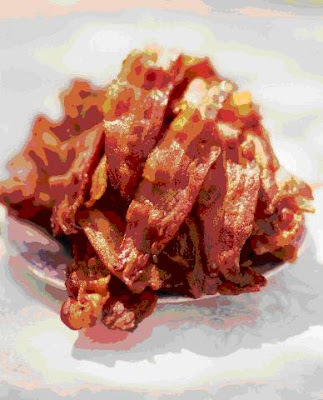 Now I am a bit partial to the odd bit of bacon in the morning but like everyone else I hate the mess that goes with it. Cooking it in this way is so simple that I am surprised that I hadn't thought of it years ago. I was so excited at that moment that I had to email straight home to share my new point of wisdom with someone who would appreciate it! So I thought. I have travelled all the way to Chicago, leaving my family for five whole days - just to learn how to make bacon! Ummm interesting!! So - what you do is preheat the oven. I use 175c in my fan oven. Cover a baking sheet with foil and pop in for about 15 to 20 mins, depending on how well done you like it. I must say a big thank you to Charming & Delightful - without her tip I would have been completely disillusioned! Since returning from my Chicago adventure I have had lots of approaches from brands asking me to review their stuff. After thinking long and hard about it I have decided to make Saturday my regular product review slot. I have a bit of a backlog and I'll try to get through them a couple at a time. Your thoughts and comments - as always, are appreciated! To begin - we were sent some Little Yeo's Yoghurts for the crew to try. It has been well documented on my blog that my kids are pretty terrible eaters. But one thing that they can be guaranteed to scoff down is stuff like this. The bag of chilled stuff arrived just in time for breakfast and the first four pack was gone in a jiffy. Verdict from the monsters.... "Can we have another one please?" 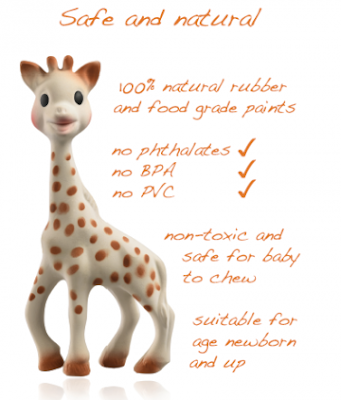 Suitable from just six months they are a perfect weaning food. 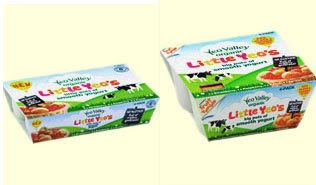 Made from mild creamy organic wholemilk yoghurt and natural fruit purees with no artificial flavours, colours or sweeteners. They come in two pack sizes. Six pots of 55g (the ideal size for babies) and a four pack of 90g pots - that my lot wolfed down. The cost around £1.69 from all major supermarkets.